Flying with your bike can be a hassle or perhaps even a nightmare. 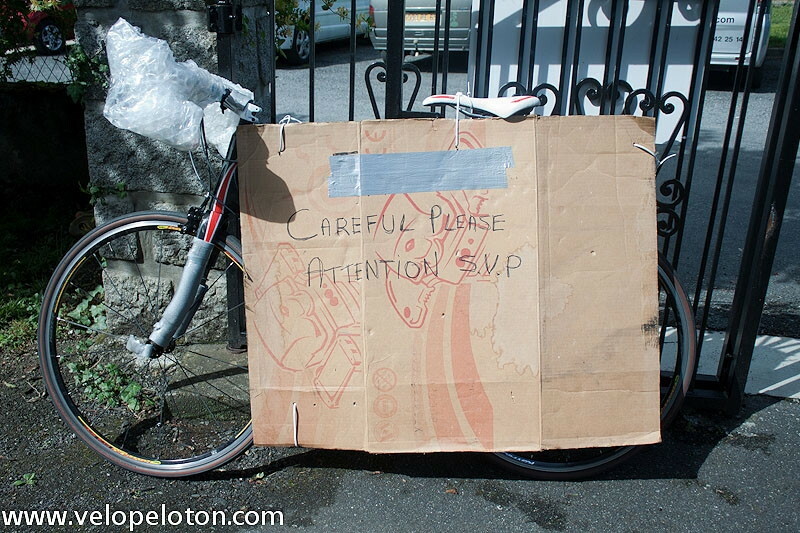 The internet is full of horror stories of lost and damaged bikes or uncaring or malicious baggage handlers. The truth I believe, is no so bad. In the 6 years that we have been running Pyrenees Cycling Lodge we have had over 1000 visitors and I guess about 600 who traveled with bikes by plane. Of those only 3 have arrived with bikes damaged in transit and all were easily fixable. The worst was a bent rear derailleur hanger. I used a pliers to bend it back. We have had more riders damage their bikes themselves when rebuilding them on arrival. Usually by ringing the derailleur bolt in the hanger, rendering the bike useless. Some are fixable by drilling the hanger and using a bolt sock, others may have replaceable hangers but most have the hanger fixed to the frame meaning that the bike has to be returned to the manufacturer for repair. Basically be very careful not to over tighten the bolt. Another problem flying with a bike, is the airline losing your bike. This has never happened here as far as I recall. There has been times that the bike has not arrived at the airport along with it’s owner, but the airlines were always able to say where it was and in all but one incident they delivered it to the lodge next morning. The rider was here but United had forgotten to load his bike in Denver. Air France flights from Paris to Tarbes or Pau are operated with small jet aircraft. If the flights are full your bike is very unlikely to travel with you and will be on a later flight that evening or early next morning. In which case a courier will deliver the bike to the lodge. It’s a very stressful situation and is best avoided. If you arrive in Paris with your bike, hold on to it. Take the TGV or night train from Paris to Lourdes. Options for flying with your bike. Most shorthaul flights in Europe will take 6 bikes fully assembled and wheeled up to the checkin desk. We’ve never had one arrive like this with a problems. Personally it’s not one I’d try with my Colnago. This bike is ready to fly to Dublin. Great option. Get a bike box from a bike shop and use lots of bubble wrap and duct tape. It’s cheap, light and very effective. Chuck tells us how to pack a bike in a cardboard box. I have a bike bag with wheels. It’s light, easy to pack and if you use pipe insulators for the tubing and lots of bubble wrap it works great. I also think that baggage handlers will be more careful with a bag as it seems fragile. This is the most popular option. A hard case is not cheap but it offers great peace of mind. However the bikes that have arrived here damaged were in hard cases. The general opinion is that baggage handlers are less caring of a hard case as they believed then to be more robust. I should add here that I don’t believe baggage handlers ever purposely damage bikes or other luggage and certainly the airlines would not want complaints from customers with broken bikes. I’m sure that any baggage handler who caused damage would be looking for a new job pretty quickly. Best bike boxes and bike bags from Bikeradar. How to pack a bike box by Pedal Dancer. Karen from Pedal Dancer is a great source of knowledge on all things bike. Advice from the experts at Global Cycling Network. 5) Alternative to flying with your bike. An alternative to flying with a bike, it to box it up and send it with DHL or another courier. They will deliver it and collect it from Pyrénées Cycling Lodge. It is more expensive than carrying it with you but it sure is a lot more convenient. Renting is a great alternative to flying with your bike. It will be more expensive that carrying your own bike. You need to accept that renting means compromise. Perhaps the bike will not be as good as your own or even a small thing like handlebar tape may not be to your liking. However renting is very convenient and most bike stores in the Pyrenees will have bikes available. One great aspect of renting a bike is it allows you to try out different models of bikes, you may even find that they are better than your own. Bikes can be rented from Pyrenees Cycling Lodge & Bike Rental in Saint Savin. Cyclist accommodation and bike rental between Col du Tourmalet and Col d’Aubisque. PreviousPrevious post:Col de CouraduqueNextNext post:Tour de France 2015 in the Pyrénées. I found this his article from CTC useful. I have taken my bike to France every summer for the past six years and have had only minor problems. Once the bike was delayed for about 4 hours when I arrived in Europe. And last summer it was delayed on the way back to the U.S. for a few days. If you pack your bike correctly, there is little chance that it will be damaged. As Paddy points out, pipe insulation and bubble wrap. I have been using a soft case made by Pika Packworks (http://pikapackworks.com). Many pros use the same case. The case is compact and doesn’t weigh much. Since it doesn’t look like I am checking in a bike, the case usually flies under the radar. In fact, I have only been charged by the airlines one time. I figure that the case has paid for itself several times over. I have traveled to France most years for the last 2 decades. Tried everything and I keep coming back to the same method. A cardboard box from my local bike store. It cheap, light and as I live in an apartment I don’t have to store a box or bag. Plus in France I don’t need a big rental to transport a box. I have discarded boxes on arrival and picked up another for the return weeks later. The handlebars must be flush with the frame. Bicycles with hydraulic suspensions or brake systems will be accepted. A non-refundable fee will be charged. A bicycle can be added at the time of making your booking. Alternatively if you wish to add a bicycle once your booking has been confirmed and your booking was made online at easyJet.com please login to your My easyJet account and go to ‘My bookings’. Click the ‘View’ button on the required booking and ‘Add Sports Equipment’ from the menu on the right hand side. If your booking was made through our contact centre, at the airport or by a travel agent you can add a bicycle by contacting our Customer Service Team. Easy-jet will take bikes in a plastic bag. More support for the plastic bag. A baggage handler has his say.